i took a stab at this dish years ago. i first had it a thai restaurant in houston...an real institution. i was a bright-eyed teen from a small, smelly industrial town back then dying to see the world. i got all the culture i could by driving 45 minutes to the city every weekend with 10 bucks in my pocket. who knew 10 years later i'd be spending the holidays in singapore. crazy! now, back the the restaurant. front of the house was ran by a pissed-off old thai man...took ALL the orders, brought out all the drinks and food, rang up the register, the works! he did give a wink now and then if you ordered your food "thai hot". he called me sweet and spicy, cause i always paired my nose dripping, eye watering dish with an ice cold thai tea. his wife, also a multi-tasker, ran the back of the house and made the phenomenal food. truly delicious...taste just like the grub in southeast asia. 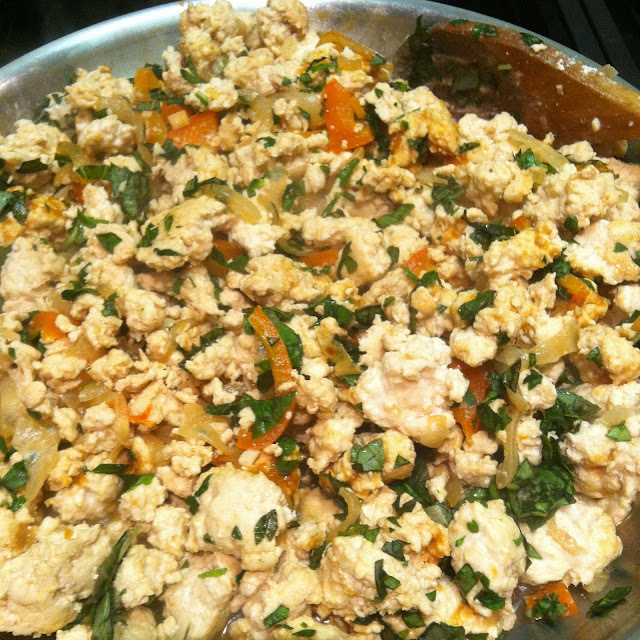 to make this super, super easy you can buy ground chicken from the super market. ground turkey can be found just about any where. fresh ginger is the best; however, i must tell you i always have a jar of 'ginger people' minced ginger in the fridge. if recipe calls for ginger, this is what i use. as far as the basil goes, look for the thai basil, but if you can't find it, any basil will work. no one will be able to tell the difference. at dinner, if someone happens to call you out for using italian basil, simply mark them off your guest list. unless your caught using dry basil...you deserve to be chastised for that! this is an asian dish and if you noticed, there's no rice on the ingredient list. for any recipe that calls for rice as a base, like in any asian or cajun dish, i use spinach. don't get me wrong, i can put down some rice. i just save it for a treat when we dine out. start by cutting up the chicken into 1 inch cubes, and mince up the garlic. rince and chop the basil. rinse and cut stem off chiles. mince the chiles in a food processor. you can use a knife, but i recommend you use gloves. if chopping onions makes you cry, you might want to use goggles for this step. you could skip the chiles all together, if you don't want any spice. place the chicken in the food processor and pulse. keep an eye on the chicken. you want it a bit chunky...don't want to end up with finely ground mush. do it in two batches for best results. heat a large pan over high heat, and add 1/2 tbsp of olive oil. toss in the chopped onions and saute for 3 minutes. toss in the bell pepper and saute for 1 minute. if everyone enjoys the heat, you can throw in the chiles at this point and saute for a minute. otherwise, add it later (i'll explain below). then, add the garlic and stir until fragrant...about 45 seconds. keep it moving, so you don't scorch the garlic. add the chicken. in a small bowl, mix the ginger and soy sauce. drizzle over the chicken. stir and cook for 5 minutes. throw in the basil and cook another 5-8 minutes while stirring. check for doneness. at this point, you can scoop out 1-2 cups of the chicken mixture and set aside for your little ones. now, add the chile peppers and stir. cook an additional 2 minutes. serve over fresh spinach. add salt and pepper to taste. rest in peace, thai nazi. i know i don't do you justice, but i sure as hell try!